It’s easy to take for granted how much of a luxury modern plumbing is. People used to have to go through tremendous lengths to find fresh, clean drinking water, and we have it at the tip of our fingers. That is, of course, until we turn on our faucets and we’re greeted by a nasty rising pool of discolored water. Have you ever seen dirty water bubbling up from your drain? Have you ever turned on the water to wash your face, only to be greeted by nasty brown liquid? 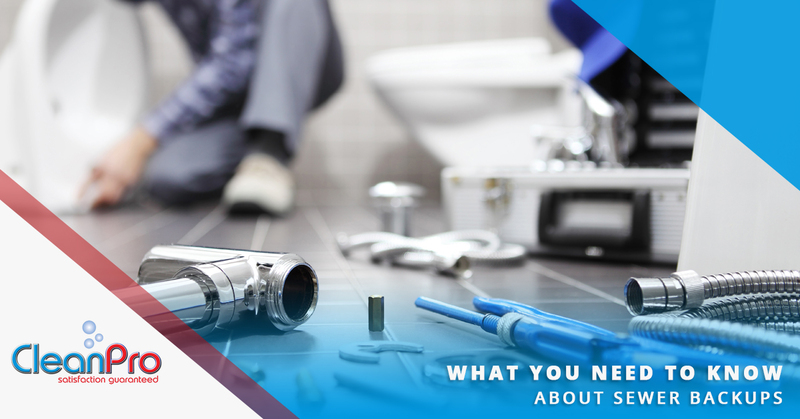 If these things have happened to you, you’re likely experiencing a sewer backup. Sewer backups can range from mild to extremely serious, but the one thing that they have in common is that they’re pretty much always unpleasant. Fortunately, our team at CleanPro is highly experienced in tackling sewer repair jobs, and we’d be happy to lend our services to you. In the meantime, here are some things you should know about sewer backups, sewer pipe damage, and how to go about repairing it. Predictably, water will build up when it’s literally unable to pass through the pipes. If your pipes have experiences some kind of clog, you can bet that water is going to start pooling up. The good news with clogs is that they’re usually easy to identify since they often are local to one area of your plumbing (for example, clogged toilet pipes will back up the toilet, but nothing else). There are a number of things that could cause a clog. Toiletries: Everyone has experienced a toilet clog at least once in their life, right? Yeah, it turns out that you can’t just stuff unlimited amounts of toilet paper, tissues, diapers, or whatever else into your pipes. Roots: Tree roots are a big problem for sewer pipes, for multiple reasons. One of them is that they can penetrate into the sewer pipe and cause a major blockage. And, unfortunately, tree roots aren’t quite as easy to take care of as toilet paper is. Hair: Most short-haired men probably haven’t had a problem with their hair causing major blockages, but ask any woman with long, luxurious hair, and she’ll testify to how problematic hair can be. Hair has a tendency to fall off without us noticing, and it doesn’t play well with pipes, often building up into big clumps, even if it forms one hair at a time. Grease and Fat: You know what happens to grease and fat when you leave it be. It hardens and turns into a solid mass. Why should it do any different in your pipes? It’s good to avoid pouring grease down your drains, because it could very well not end up fully washing away. Damaged pipes can cause sewer problems. First of all, they can be directly responsible for causing clogs — when pipes start to rupture, dirt and debris from the surrounding earth could find their way inside. There is also the aforementioned problem of roots, which simultaneously break and clog your pipes. Broken pipes can also form “dips” that water has trouble flowing through, which can cause irregularities in the way that your sewage flows from point “A” to point “B”. Pipe Bursting is a method of sewer line repair in which a small hole is dug into your yard, which exposes an area of the damaged pipe. The pipe is punctured, and a cone-shaped apparatus is inserted inside, which is connected to the tip of a new pipe. On the other end, a machine pulls the head forward, the cone-shaped tip rips through the existing pipe, “bursting” it into oblivion, leaving the new pipe in its place. If you want a visualization, think of a plastic straw, the kind you’d find at a fast food restaurant. Then, imagine forcing a sharpened pencil through it. Straws are slightly smaller than pencils, and if the force was strong enough, it’d burst at the seams. This is what happens with pipe bursting, and a new modern pipe is left in the old one’s place — a pipe that will be much more resistant to environmental damage due to advances in technology. If you have a bad case of sewer backup, it’s time to call CleanPro, LLC. Our cleaning company does a lot more than clean — we have an exhaustive list of services that cover just about every need you might have in cleaning, maintenance, and repair, whether it’s for a commercial building or a residential home. One of the things that we can help with is sewer backup. Do you need us to fix a broken sewer line? Is there something in your plumbing that might be causing your water to backup? Do you have no idea what to do if puddles of sewage water have started forming on your lawn? No matter the problem, we’ll be able to help. We’ve served clients all over Massachusetts, operating primarily in the Gloucester and North Shore area. It’s important to have your sewage needs accounted for, especially in the holiday season where you’re likely to have guests. Want a free quote for our sewer backup and repair services? Contact us today!